"Surgery at a Glance" provides a concise and accessible introduction and revision aid for medical students undertaking their surgical attachment. Following the familiar, easy-to-use 'at a Glance' format, each topic is presented as a double-page spread with key facts accompanied by clear diagrams and photographs encapsulating all that the students need to know. 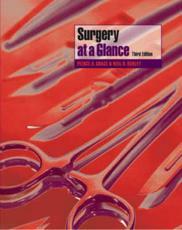 This new edition of "Surgery at a Glance": Is THE book for surgical finals. It focuses on the core principles and the important diseases appropriate to the current curriculum, and is divided into clinical presentations followed by major surgical conditions. It contains 5 new chapters on: stomas and incisions; anaesthesia; surgical infections; lymphoedema; and solid organ transplantation. Features a new tinted box for the cancer chapters that provides the 2-week-wait referral criteria. "Surgery at a Glance" will appeal to all clinical medical students, junior doctors on the Foundation Program and surgical nurses. Reviews of last edition: "This book is ideal for finals as diagrams help the revision numbed mind to retain information. It is extremely quick and easy to read and the list-based information is an ideal basis for short-answer questions." - Barts and the London Chronicle. "Delightful book...the quality of the diagrams is such that for the majority of topics the text is almost superfluous." - British Journal of Surgery.